Discover spiritual songs from The Secret Place. These spiritual songs are not just a listening experience but encourage you to sing your own psalms hymns and spiritual songs. Take a little time to watch this music video. With an emphasis on spiritual singing and prayer, this song is sure to capture your heart, and leave you with an enduring sense of His presence, and a hunger for more. I encourage you to draw aside and join us in singing your own spiritual song in His presence. Song Notes for this spiritual song. When Jesus said "out of your belly shall flow rivers of living water" I believe He was referring to the work of God's Holy Spirit that resides within us. When I worship "in spirit and in truth" from my inner most being, there are times when my human language just cannot express the depths of what I am feeling. That is where the Spirit comes to my aid, as Jesus promised, and rivers of prayer and worship flow from deep within my inner man resulting in heavenly sounds that originate from God's spirit within me. "One of the reasons why I sing in tongues, is because just as praying in tongues is an aid to prayer when "we do not know how to pray", so too is singing in tongues an aid when we do not know how ( or what ) to sing! Paul says, "I will sing with the spirit, I will sing also with the understanding." Singing with the spirit then is obviously singing without the understanding, since it is contrasted in this verse of scripture with “singing with the understanding.” We are expected then - as in Paul's demonstration of the gift - to sing with the understanding and also sing without understanding. Why this would be the case, is one of the mysteries of being a spirit-filled believer, but our understanding does not have to be complete in order for us to benefit from it. "Experience the wonder and excitement of a fresh encounter with God." This may raise the question in the minds of some as to why I record singing in tongues for others to listen to, when neither they nor myself can understand it. I have several thoughts on this, but my main reason is that I believe the words minister life to the human spirit. Our human mind does not need to understand the language for our spirit to draw life from it. Jesus said, "the Words that I speak to you are spirit, and they are life." In other words, there is a relationship between words spoken and the spirit of a person. When a person speaks they are speaking out of their spirit." Read full article: Singing In Tongues - Why do You Sing in Tongues in Worship by Ray Watson. This song consists entirely of free worship and was recorded live during our services at Pursuit Church. Apart from minor editing it remains just as it was recorded. This is raw worship that captures something of the presence of God that we long for. The song has been recorded as an aid to personal worship. The free worship (which includes long passages of singing in the spirit) have the purpose of encouraging the listener to sing their own spiritual song while soaking in God’s presence. As you experience this new prophetic psalmist anointing, I'm sure you will sense with us the wonder and excitement of a fresh encounter with God. Like Listening to Spiritual Songs? Discover The Secret Place ? intimate songs of the heart. If you liked this song, we offer it as a free mp3 player for your website or blog. Click below to get the code and start using it as background music now. 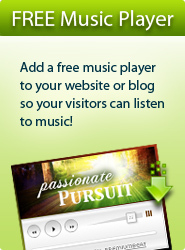 We also have an extensive range of other free mp3 players for you to use.